‘Having a downer on yourself’ means that you put a negative spin on your appearance, abilities and competencies in various situations. It’s essentially a form or prejudice directed towards your self which colours how you view the world, including self-confidence, and what you do in the world. Reviewing my notes after a session with one coaching client, I saw that I had scribbled ‘prejudice’ in the margin. However it wasn’t in the way that we usually understand the word. It wasn’t negative attitudes towards a target group. Instead, I noticed a pattern of the deeply ingrained negative attitudes that the client directly towards herself. For this I coined the term auto-prejudice. This is a form of ongoing negative auto-biography, a story that we tell yourself and others about yourself. It frames your life. Prejudice literally means ‘to pre-judge’, and as with all forms of prejudice , auto-prejudice forms a perceptual filter by which we process all information about ourselves. So the stuff that affirms the negative view is readily accepted while anything that contradicts the negative is either ignored, discounted or explained away. Defining negative attitudes to the self as auto-prejudice opened up a whole body of research that I could bring into my (life) coaching practice. One of the things I’m particularly pleased about in my book Unlock Your Confidence is that I was able to draw on training programmes that address discrimination. The only difference is the target of discrimination is your self. My earliest research in social psychology had been in attitudes, stereotypes and the way we view the world. In particular I explored the impact of The Authoritarian Personality by Theodore Adorno and colleagues. The main factor I explored was the concept of Intolerance of Ambiguity (researched by Adorno’s colleague Else Frenkel-Brunswik). To put it simply, some people have a stronger need for certainty and black-and-white thinking than others. For some people it causes distress when things don’t fit into discrete categories. Sometimes this distressed is reduced by denying the grey areas to create cleaner boundaries. The tendency to make cognitive distortions is a key feature of Cognitive-Behavioural Therapy (CBT). These are basically logical errors in the interpretation of what life presents us with. Sometimes people select only the evidence they consider relevant, that is consistent with the negative attitude. Sometimes they go beyond the evidence to reach conclusions that are not supported under closer scrutiny. Part of CBT treatment involves a logical disputing by checking the evidence to gain a sense of balance and challenge distorted views of the self and the world. It’s part of our psychological make-up to think in stereotypes. We can’t process every single bit of information that comes our way. Instead we operate on cognitive economy. Stereotypes create a framework to reduce cognitive overload. The problem is that often they contain false assumptions. Often a stereotype operates a filter that leads us to accept things that confirm the stereotype and reject or modify things that refute it. This is particularly pertinent to self-esteem. Many people are also burdened by a strong cultural mantra that ‘self praise is no praise at all’. So what we have is a strong tendency to evaluate ourselves in a negative way. What do attitudes and confidence have in common? Many people declare that they would take more chances in life if only they had the confidence. The implication is confidence precedes action. To a certain degree this is true. The study of attitudes reveals a link between thoughts, feelings and actions. The literal meaning of attitude is ‘fit and ready for action’. So, life-affirming feelings and thoughts are more likely to lead to life-affirming actions. Part of being confident is having the courage to take action. However it’s a circular model. Taking actions can change attitudes (thoughts and feelings). Taking action can build confidence. This is at the heart of the ‘fake it ’til you make it model of confidence. My approach is to take a three-pronged approach to work on thoughts, feelings and actions to build confidence. My job as a coach to help clients reassess the stereotypes they hold about themselves. This is achieved by a logical, rational approach to help you to reassess the data they use to form and maintain your negative attitudes. Auto-prejudice will sift the evidence to find things to maintain the negative view and convince you that ‘if you don’t try then you can’t fail‘. Auto-prejudice focuses on the problem so that the problem just gets bigger and bigger. Coaching provides the antidote by exploring solutions. In a typical coaching session I will spend 20% of the time with you exploring the problem and 80% of the time exploring solutions. When I was undergoing my coaching training during a coaching session my coach I got locked into describing a problem in the finest of detail. After a while my coach asked quite bluntly ‘where are we going with all this?’ At least that is how I heard it. However, it gave me the jolt I needed to switch to solution thinking. It’s clear the coaching works better if the coach and the client work together. There is little point if the client’s aim is to convince the coach that ‘life is crap and all action is futile’. My own softer version of the intervention is ‘I’ve got a really clear idea of the problem and what you want to move away from. What’s less clear is what you want to move towards? Perhaps we could spend some time on that?’ A simpler intervention is ‘So what do you want instead?’ For me coaching is about helping people engage with a different view of themselves in the world. It is also the main aim of this blog and my books. 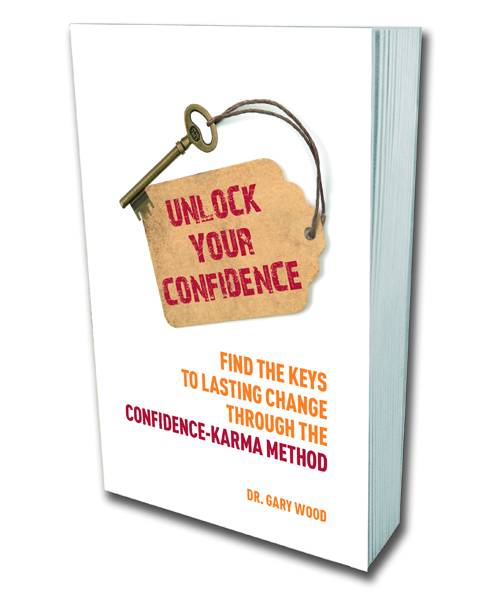 Unlock Your Confidence is my attempt to bring together my academic background with my coaching and teaching practice. It’s my personal and professional journey in confidence building. I often say that it took me longer to live it than it did to write it. It’s also a very collaborative affair. I love the idea that the reader continues to write where the author left off. I’m aware that some people like to adopt a more analytical approach and so I have included material that I wouldn’t necessarily bring into a coaching session such as defense mechanisms and elements of Transactional Analysis. The aim is take things a bit further than the average self-help book. So what I’ve attempted to do is to distill the essence of theories and concepts to generate new insights that will inspire you to action. In this way, the book maintains the 80:20 rule. It’s still mostly concerned with tackling auto-prejudice and entertaining solutions rather than incubating problems. What is explicit throughout the book is the use of solution-focused language. The aim is that by repetition you will learn and embrace an alternative way of viewing the world and your place in it. As you challenge your own self-limiting attitudes there is always a knock on effect. So the book also provides a blue-print for passing on these insights to others. It’s what I call Confidence Karma. You gain confidence by building it in others. A key theme in the book and in my coaching approach is ‘Little by little, a little becomes a lot’. So if you have enjoyed reading this blog post please share it with friends and colleagues on your social networks.